45 mil EPDM flexible rubber pond liner with 20 year manufacturer's guarantee against UV breakdown. Ozone resistant. Will not blister, crack or deteriorate in direct sunlight. based on the shape of your pond. Select your Pond Shape Below. Custom cut pond liner sizes are also available. *Enter the quantity in square feet you need when you get to the shopping cart. Then for your needs you may enter the exact dimensions in the "special shipping instructions" section upon check out. if you need help, feel free to contact us. PondGard is a highly stable material. 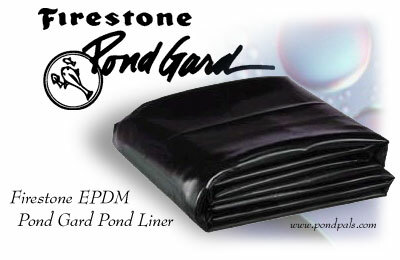 The Firestone PondGard logo imprinted on the EPDM liner indicates that it is specially formulated to be safe for exposure to fish and plant life in decorative ponds. PondGard Pond Liner stays flexible in a variety of temperatures - from - 40 F to 175 F enabling it to be installed year round. And unlike some liner materials, PondGard EPDM contains no plasticizers which can become brittle with age and cause cracks or splits in the material, threatening fish and animal life. PondGard Pond Liner's flexibility provides flexibility in pond design, too. Unlike preformed liners, PondGard can easily be shaped to fit the unique contours of your pond, giving you much more creative design versatility. In addition, PondGard Pond Liner comes in a variety of lengths. Multiple membrane panels can quickly and securely be seamed with the QuickSeam Tape System to accommodate larger pond lining applications and unique design elements such as waterfalls. PondGard Pond Liner shows outstanding resistance to the harmful effects of ultraviolet radiation (UV), ozone and other environmental conditions - important characteristics especially along the water line of the pond where the liner can be exposed. PondGard EPDM has high expansion and contraction characteristics which enable it to conform to objects in the subgrade. This feature is especially important after the pond is in service when earth movement, or erosion, could cause roots and rocks to be dislodged beneath the membrane, placing stress on the liner. PondGard Pond Liner's high elongation properties will enable it to stretch over the object. PondGard Pond Liner requires little or no regular maintenance once installed. Should the need arise, it is easy to repair in place with a self-adhesive QuickSeam Joint Cover Patch, minimizing cost and inconvenience. WARRANTY: PondGard EPDM Rubber Pond Liner is backed by a 20-year membrane warranty. PondGard Pond Liner installs quickly and easily. No special tools or skills are required.